Once again, the Order of St Lazarus is organising a Sponsored walk for members and friends this Sunday. The walk will place in Lancashire where members and friends - including the Chaplain General - will walk through Cuerden Valley. If you would like to join us, or make your own walk locally, please do, starting at 2pm from St Catherine's Church. Alternatively, you can sponsor our Chaplain General or any of the walkers. I don't think it will be as green as the photo above but the forecast is that it will be cold but sunny. Thank goodness for the soup rolls awaiting us on our return! All funds raised will go to SUROL, our partner charity in Sri Lanka which cares for those suffering from leprosy. If you would like to support our fundraising efforts please contact us. During the walk we will pass by Cuerdan Hall. The original house on the site, dating from the 17th century, no longer exists. The Charnock family of Charnock Richard, owned the estates until 1521, when Richard Charnock of Cuerden and Leyland sold his manor to Thomas Langton, Lord Newton. In 1605 Henry Banastre of Bank Hall bought the Cuerden Hall Estate from the Langton Family, (Barons of Newton-in-Makerfield) Henrys daughter Alice, wife of Sir Thomas Haggerston Bt, held ownership in 1641. The present building dates from 1717 and was erected by Banastre Parker, son of Robert Parker, the former High Sheriff of Lancashire for 1710, when he moved the Parker family from Extwistle Hall. Upon his death in 1738 the estate passed to his son Robert Parker (1727–1779) and in turn to his grandchildren Banastre Parker (1758–1788) and Thomas Towneley Parker (1760–1794). During the First World War Tatton adapted the Hall for use as an infirmary for troops, and between 1 May 1915 and 8 June 1917 it was known as Cuerden Hall Auxiliary Hospital. The drawing rooms, with the Tatton family’s collection of old masters and portraits still adorning the walls, were turned into wards and furnished with beds, bed linen and equipment, whilst the parkland and gardens provided an area for convalescence for the soldiers, enjoying such activities as boating on the lake, haymaking, and picnicking. During the Second World War, the estate was requisitioned by the Ministry of Defence and converted into an Army Education Centre and later became the British Army Divisional Headquarters of the Anti-Aircraft Command. By the late 1950s the Hall had been in use by the Army intermittently for a number of years and in 1958, after nearly 250 years of private family ownership, the Hall was finally sold by the Tatton family to the Ministry of Defence and it became the Army's Headquarters North West District. There is an interesting bit of religious history to it as well. Thomas Woodcock died at Cuerden in 1602 holding 'the capital messuage called Lostock' in Cuerden—no doubt the house later called Woodcock Hall (nearby but demolished in the late 20th century) —with lands in Cuerden and nearby Walton-le-Dale. This 'Lostock' had belonged to the Hospitallers - although I cannot find any record of which "Hospitallers"
The above named Thomas left a son and heir John, aged nineteen. But another of the same name, born about 1603, is of more note—the Blessed John Woodcock. He became a student at St. Omer's and afterwards in 1629 proceeded to the English College in Rome. Next year he joined the English Franciscans at Douay and was sent to England for a time. On a later mission he was arrested soon after his arrival in Lancashire and was barbarously executed at Lancaster for his priesthood, 7 August 1646. This detailed account of his life comes from Josie Bolton. John Woodcock was born in 1603 at Woodcock Hall. His father conformed to save his estate which had been in the family for 400 years but his mother (born Anderton) kept firm to the Catholic faith. John would have known the Burgess family as they leased Lower Woodend from his relative John Anderton. John became a Catholic in his late teens, which displeased his father so much ,that he went to live with his Anderton relatives until he was sent abroad to study for the priesthood. 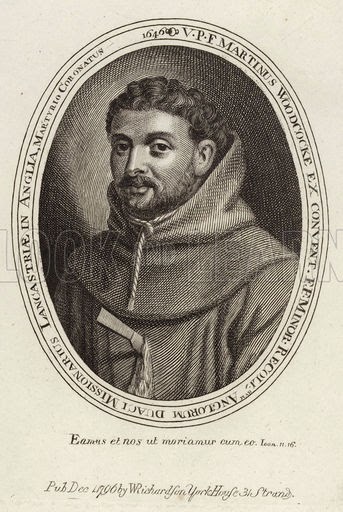 He became a Franciscan .He served in England for a time in 1640 and then returned to France but he was very keen to return to England to serve his people. He sailed to Newcastle and making his way from one safe house to the next, he eventually arrived at his family home in August 1644. This was at the height of the Civil War, and a dangerous time especially for Catholics, who mostly supported the Royalist cause. When he arrived , he arranged to say Mass during the night of the feast of the Assumption(August 15th) on the Missionary Altar at Woodend for his relations, the Burgess family and neighbouring Catholics. But just as he had finished hearing confessions and was standing in his vestments waiting for the clock to strike twelve when he could start to say Mass, one of the neighbours came rushing in to beg all to disperse immediately, as the pursuivants were coming! Fr Woodcock immediately took off his vestments, closed up the altar and got into the priest’s hiding -hole, before the pursuivants arrived. I had quite forgotten. There is a hiding hole in that house. They searched the farmhouse , but happily could find no trace of the hidden priest, and left disappointed. As soon as the pursuivants had gone, Fr Woodcock came out from his place of concealment and , the few Catholics in the immediate neighbourhood returning , he said Mass, gave them Holy Communion and then hastened away before daybreak to his father’s house nearby. I was put into the hiding place. I think I can find it again, behind a certain panel.” The pursuivants returned with the traitor to the house at Woodend, and he went immediately to the hiding place and withdrew the panel, but found the place empty. Mr Woodcock, hearing of this, was afraid if his son the priest was caught in the mansion he would lose his estate, and therefore gave his son his breakfast and ordered him out of the house as quickly as possible. Fr John had not got a mile away from Woodcock Hall, when the traitor and the pursuivants overtook him on Bamber Bridge, arrested him, and brought him before the magistrates who ordered them to convey him to Lancaster Castle. There he was kept in prison for two years and was finally put to the cruel death of hanging drawing and quartering with two other priests Fr Edward Bamber and Fr Thomas Whitaker on August 7th 1646. Their deaths are recorded, with other martyrs, on a plaque in St Peter’s Cathedral, East Rd, Lancaster. The vestments, which Blessed John Woodcock wore at his last Mass, are much worn with age, but are preserved with the Burgess altar at Ladyewell. BURNS’ NIGHT DINNER & CELEBRATION.